It's snowing in Atlanta, and I'd like nothing more than to go outside and create armies of snowmen doing horrible, horrible things. Alas, LEGO artist Tyler Sky's Calvin and Hobbes tribute shall have to suffice. We are not used to snow in Atlanta, to the point where we hardly ever look out our windows, even when one is directly in front of us as we write this post. I am not exaggerating. So when I left for lunch at noon and found myself in the middle of a snowstorm, I was a bit surprised. Granted a snowstorm in Atlanta is mild flurries in say, New York City, but it's still shocking and unexpected. Traffic slows to a crawl, everything closes, milk disappears — there is seriously no milk available in a 10 mile radius, outside of looting houses. So I am staying inside, where it's warm, living, as I have many times before, vicariously through Calvin and Hobbes. Tyler Sky built Calvin and Hobbes out of everyone's favorite plastic building bricks late last year. 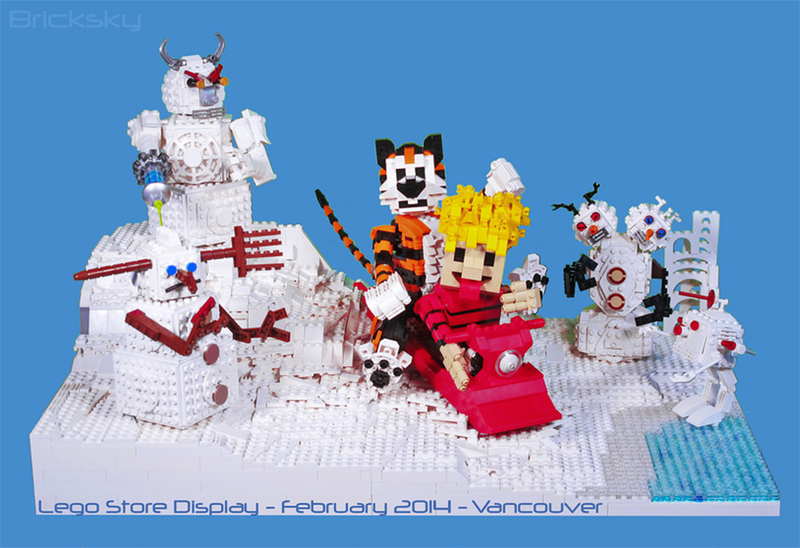 The dynamic duo is joined by a group of Snow Goons for an in-store display at the LEGO Store in Vancouver's Oakridge Mall next month. Check out more shots and the rest of Tyler Sky's magnificent work at his Flickr page.